and in our own Home Spa's for pennies! addition to your home-spa pantry. Use your favorite coffee in a fragrant, pampering body scrub. Why coffee? 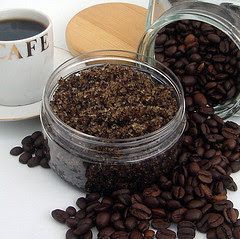 Coffee grounds are a natural exfoliator. Exfoliation is the removal of dead, dry skin cells that collect on the outer surface of the skin. The coffee buffs these unwanted cells off and speeds up our own skins natural renewal process, producing healthy glowing skin. Also, coffee's natural caffein content is used as a topical treatment for cellulite, as it dilates blood vessels which increases speed and volume of blood flow. Which, in theory, helps remove excess water from our tissue, thus improving the skins appearance and tone, according to the University of Sao Paulo 2008 study. (ok girls, we all know we cannot fully get rid of our cellulite, but we can reduce the appearance of it , weight loss is also key). Note: We are talking about a body scrub here, not a facial scrub. Facial scrubs are composed more gentle than body scrubs. Ever wonder why you have alligator skin legs even after using quality lotion? Its time to exfoliate. How: Apply this in the shower, it will be slippery, or sitting on tub side. Take a palm full of scrub and apply in a circular motion, paying attention to cellulite areas, small varicose vein areas, and dry skin areas. 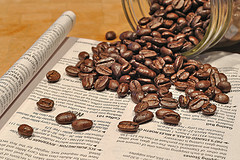 3 TBL coffee grounds; Use new grounds for the greatest application of caffein. 1 TBL natural oil of your choice: like olive oil, grapeseed, coconut (melted), almond etc.. Don't use any petroleum based oil as this will clog pores! Olive has a heavier feel, is naturally hypoallergenic and is full of vitamin A and E , helps repair skin....grapeseed oil is lighter in feel, silky, not oily, and penetrates the skin quickly. It is cheaper than olive oil and is easily found in the grocery store with the other oils. This is a great choice for scrubs as it has almost no scent and is good for sensitive skin. Great for cooking too. 1 TBL sugar: white or brown or a mixture of both. Mix all dry ingredients, then add oil (s). Oil amount is your preference based on how much coffee grounds you are using. Make this in single use amounts, or make a larger batch and store in frig if you used wet grounds. Final scrub consistency is your perogative, some like more oil than others, some like it dryer. Experiment. There's no wrong or right. grounds if you make a one time use scrub and use it that same day. Check out my coffee soap recipe you can make yourself, full tutorial ! I have used chocolate pudding powder and with it(thus) have dyed the soap. The orange tones are from the orange peel. There is that with the baking ingredients at the supermarket. I have lightened only the bright part with Titandioxid. Thank you for answering my question about the chocolate pudding in your St Martins Day soap. I am going to try pudding in my soap! What a wonderful and natural way to dye the soap! You have many beautiful soaps on your blog, thanks for sharing your information. I just found your blog this morning via "She's Gone Digital". I read the coffee scrub recipe and had to try it NOW. I feel like I am wrapped in a cashmere Snuggie. I used olive oil as it was all I had. I think it will be too heavy for my hubby, will get grape at the store today. Can’t wait to see his face when I tell him the coffee grounds drying on the counter are for his shower tonight. Added bonus: we drink flavored coffee, didn’t even think about it until I smelled the essence of chocolate while using the scrub. We have a Christmas blend for over the holidays, looking forward to trying it inside and out. Rachelle, glad to have you stop by! I love Jan's blog "She's Gone Digital". Really like your blog! I've enjoyed the different recipes. Heather, thanks for stopping by, so glad you like the recipes too! I'm always working on something new, my kids are used to me slathering something on their faces and asking: "hows that feel"?! Just wondering if anyone had any ideas on how long this scrub might last in the fridge? Kaycee: About the Coffee Scrub, I keep mine in the frig for a couple weeks. Don't allow any water to get into your scrub as that will introduce bacteria. Keep it well sealed and in the frig for longer shelf life. I found your blog with some different recipes... Now I can't wait to try these too... Thanks for sharing with us. We do some work with BAILEYS Coffee Creamers and absolutely love your blog! Would it be ok if we featured this recipe on our Facebook page? Sure Elizabeth, feel free to share this post. I'd love to see it, let me know where on facebook ! thanks, appreciate the compliment. hi! does this scrub expire? Amielle, Hi! I keep mine in the frig for a couple weeks. It's important not to allow any water to get into your scrub as that will introduce bacteria. Keep it well sealed and in the frig. A tip for people worrying about bacteria: Keep your coffee grounds in a Zip-Loc bag in the freezer. They'll dry out and never mold. When you need to make a scrub, it'll be there waiting for you to use as needed. Thank you Emy. I'll have to try your recipe as well ! Your directions are SO complete!! Every question that I started to come up with is something that you just naturally answered as you wrote your post. Thank you so much!